Charlie Baker is the new sixth grader in Silver Lake Middle School. Middle school is a difficult period in any child’s life, but for Charlie, things are especially tough. Charlie and his family tell everyone that they have just moved to upstate New York from Cleveland, but they are aliens from Jupiter’s moon, Europa. A revolution led to a militaristic faction gaining control. Charlie’s family had to flee in order to survive. The family struggles to blend in on Earth, but their ability to read minds is both a blessing and a curse. Charlie is bullied by Caden and Jordan. He falls in love with a fellow student named Maya, to whom he reveals his secret. But Maya wants Charlie to use his gift to help others. Charlie is having enough problems trying to understand the culture and the language. He says things like “hot spaghetti” and “oh pug” leaving his fellow sixth-graders mystified. The book focuses on middle-grade issues like bullying, peer-school relationships, and first love. This tale will appeal to students struggling to fit into a new school or neighborhood. The characters are believable and realistic. 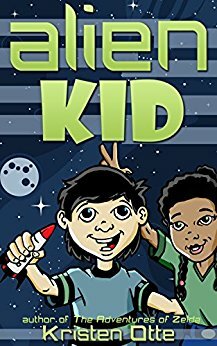 Recommended especially for readers in fourth through seventh grades, but the story is well-written and appealing for any age. I hope that he finds the book enjoyable and gets some useful information in the process.